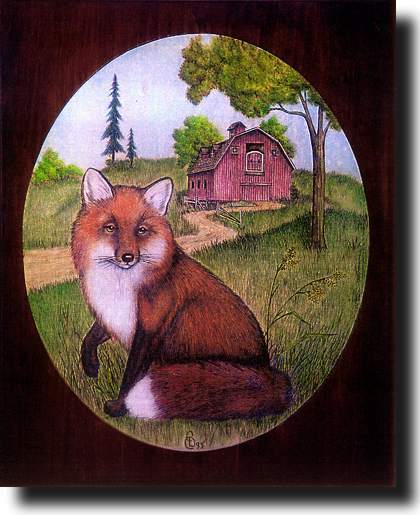 Cheryl Dow's first book includes 14 different patterns: Raccoon Wolf (full body) Squirrel Owl Barn Scene Lighthouse Fox & Barn (cover shown here) Merganser Pintail Chickadee Butterfly Fawn Moose and her now famous "Wolf Head". Again there are three versions of each pattern complete with detailed instructions. Although this book does not have a calligraphy table Cheryl does give some directions and what materials you'll need on how to use transparent oils to colors your pyrography.